White box switch, also known as open switch, has gained popularity in data centers. Because they provide high performance switching and enable users a broader choice in software and hardware purchase at the same time. However, it’s the openness of open switches that leads to other problems: is there any limitation on the use of optic modules for white box switch? How to choose an optical transceiver for open switches? As we know, open switches vendors usually sell network switches either as bare-metal devices or preloaded with any compatible operating system, as requested by the purchaser. And there are many hardware and software vendors on the market. In order to achieve the desired performance with white box switch, some users may purchase hardware and software from different vendors. For example, one network operator may buy a white box switch from Dell, FS or HPE, but he will get a network operating system from Cumulus Linux. There is no fault of this action, but it will bring another problem—which type of optical transceivers can be used for the switch? According to the situation of white box switch on the market, there are two considerations should be taken into account when choosing an optical transceiver for white box switch. The first one is the operating system (OS) of the switch. It’s known to us that there are various OS vendors like Cumulus Linux, Pica8 and HPE. They develop their own OS for their white box switch to get more market shares. Some of these companies also have their own optical transceiver production line. And some of them do not preclude the use of any industry-standard transceiver, which provide a freely choice for users to source standard components directly from manufacturers or from a broad range of re-sellers. Therefore, the transceivers from the corresponding OS vendor can be used for their open switches. Another one is the optical transceiver itself. Not all white box switch vendors can provide transceivers for their switches. And some brand OEMs add enhancements to their standardized optic modules, which increases more cost on optics. However, some open switch vendors look forward to seeing an open standard without vendor lock-in. Therefore, cost-effective compatible optical transceivers that follow MSA SFF specification is another choice for white box switch. 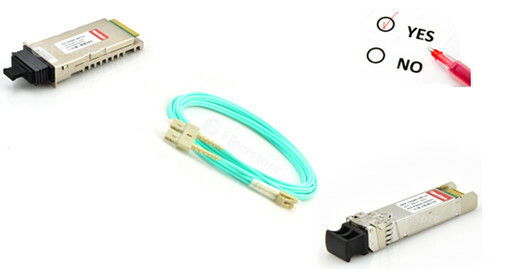 Among these compatible optical modules, most generic optical transceivers on the market can be used for white box switch. White box switches have been the way for web-scale data center operators who are able to drive down the cost and drive up efficiency and flexibility of their IT infrastructure, especially in some big companies like Facebook, Google or Amazon. And there is a growing group of companies that also want the same level of efficiency web-scale operators have achieved. How to realize this? More white box switches are required without question. White-box switch market is booming. 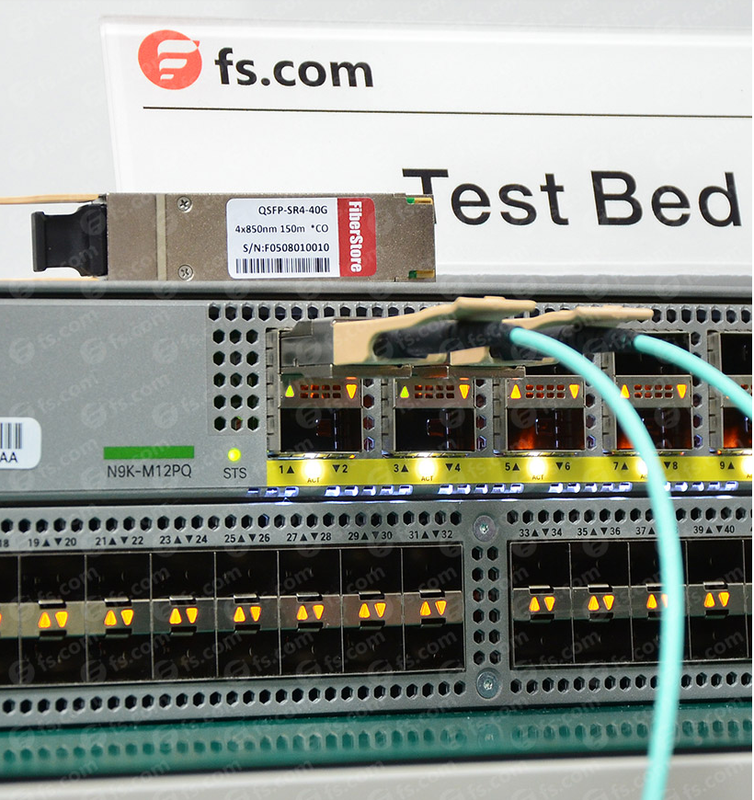 Under this situation, providers like FS.COM supplies 10GbE switch, 25GbE switch, 40GbE switch and 100GbE network switches preloaded with FS OS or Cumulus OS for small and medium size networks or data centers. And all the generic optical transceivers in FS.COM are available for white box network switches. This entry was posted in Fiber Optic Transceivers, Switch & Transceiver and tagged 10GbE switch, network switches, optical transceiver, white box switch, white box switch vendors on August 12, 2017 by Chloe Wang. How Do Optical Transceiver Vendors Differentiate Their Transceiver Design? In order to get a bigger share of the market. Optical transceiver vendors are challenged in how to differentiate their optical transceiver design and give the products conform to common form factors. To understand the importance of transceiver differentiation, it is worth reviewing the purpose of multi-source agreement (MSA) transceiver form factors. Common form factors arose so that optical equipment makers could avoid developing their own interfaces or being locked into a supplier’s proprietary design. Judged in those terms, MSAs have been a roaring success. Equipment makers can now buy optical int erfaces from several sources, all battling for the design win. MSAs have also triggered a near-decade of innovation, resulting in form factors from the 300-pin large form factor transponder MSA to the pluggable SFP+, less than a 60th its size. But MSAs, with their dictated size and electrical interfaces, are earmarked for specific sectors. As such the protocols, line rates, and distances they support are largely predefined. Little scope, then, for differentiation. Yet vendors have developed ways to stand out. One approach is to be a founding member of an MSA. This gives the inner circle of vendors a time-to-market advantage in securing customers for emerging standards. The CFP MSA for 40- and 100-Gigabit Ethernet is one such example. Some designs required specialist optical components that only a few vendors have, such as high-speed VCSELs used for the latest Fibre Channel interfaces. In turn, many vendors don’t have the resources—design teams and the deep pockets—needed to develop advanced technologies, such as those for 40- and 100-Gbps transponders, whether it is integrated optical devices or integrated circuits. Being the first to integrate existing designs into smaller form factors is another way to differentiate oneself. An example is JDSU, which has integrated a tunable laser into the pluggable XFP MSA. 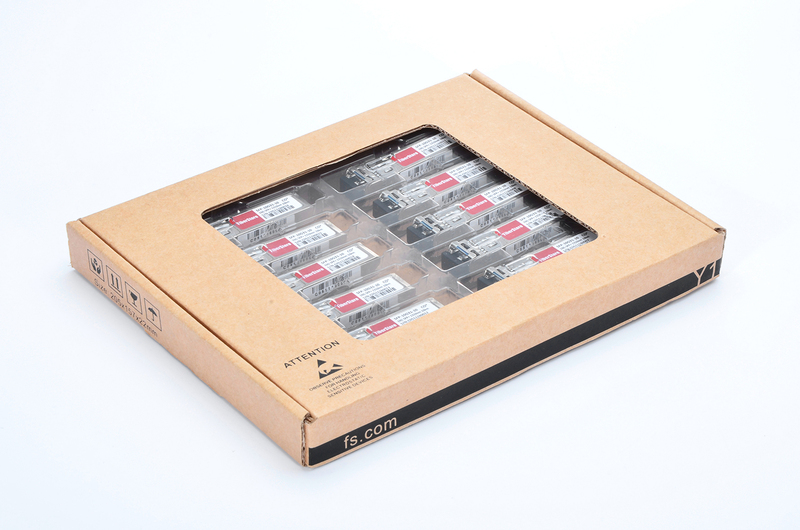 Fiberstore also then launched tunable XFP which features with tunable and multi-protocol functions in order to further expand the product lineup of the 10G optical transceiver modules. Optical transceiver vendors are also differentiating their products through marketing approaches. New-entrant Far Eastern vendors are selling optical transceivers directly to service providers and data center operators, bypassing equipment makers. They are also looking to differentiate on price, cutting costs where they can (including R&D) and focusing on bread-and-butter designs. They are quite happy to leave the leading vendors to make the heavy investments and battle each other in the emerging 40- and 100-Gbps markets. Some people think differentiation doesn’t matter so much for optical transceivers since even if a vendor gets a lead, others inevitable will follow. And anyway, the cost of transporting traffic is still too high even with the fierce competition instigated by MSAs. In turn, optical transceivers are now a permanent industry fixture and they can’t be conjured to disappear. For optical transceiver vendors, however, the result is a market that is brutal. So can optical transceiver vendors differentiate their products? Of course they can. FS.COM (Fiberstore), a company devoting on the research & development, and offering fiber connectivity network solutions for carriers, ISPs, content providers and networks, is the global market innovator and application technology pioneer in the field of optical network devices and interconnection. In the future, they seem to change this market. This entry was posted in Transceivers Common Sense and tagged CFP, MSA, optical transceiver, optical transceiver design, optical transceiver vendor, SFP on March 31, 2016 by Alice.Gui. Can We Interconnect SFP, SFP+, XFP, X2 and XENPAK? There are many kinds of 10G optical transceivers in the market such as SFP+, XFP, X2 and XENPAK. So when we use these modules, the most confusing problem is if we can interconnect SFP+, XFP, X2 and XENPAK. Besides this, some module users also want to know if they can connect SFP to SFP+ or if then can connect 10GBASE-SR modules to 10GBASE-LR modules. In this article, I will display some common questions often asked by module users and give the right answer mainly based on Cisco optical transceivers. 1. Can we interconnect SFP-10G-SR to XENPAK-10GB-SR or X2-10GB-SR? The answer is yes. For this problem, you just need the correct optic on each side. If your optics are singlemode you need singlemode patch cord. If your optics are multi-mode then you need multi-mode patch cord. SFP-10G-SR, XENPAK-10GB-SR and X2-10GB-SR are all multi-mode optics, so a multi-mode fiber can solve this problem. 2. Can LC-SC patch cord connect X2-10GB-SR between SFP-10G-SR? Yes, it’ll work fine as long as your fiber patch cord is multi-mode. Actually, the SFP+ requires LC connector but the X2 may require a SC connector. So when connect SFP-10G-SR to X2-10GB-SR, we must use a LC-SC patch cable (LC connector on one fiber end, SC connector on the other fiber end). 3. Is it possible to connect X2-10GB-LR to SFP-10G-SR? The answer is not possible. The Cisco X2-10GB-LR module supports a link length of 10 kilometers on standard single-mode fiber (SMF, G.652). However, the Cisco SFP-10G-SR module supports a link length of 300m on OM3 multi-mode fiber (MMF,OM3) and 400m on OM4 multi-mode fiber (MMF,OM4). Actually, you need to use modules with the same wavelengths, i. e. SR to SR or LR to LR. 4. Can we connect SFP-10G-SR to GLC-SX-MM? 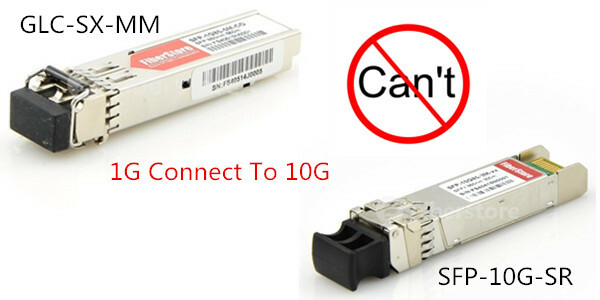 The SFP-10G-SR is 10 Gbps only. The GLC-SX-MM is 1 Gbps only. This question means can we force SFP-10G-SR to use 1Gbps speed? This is a very common question and the response will always be the same. The answer is NO. 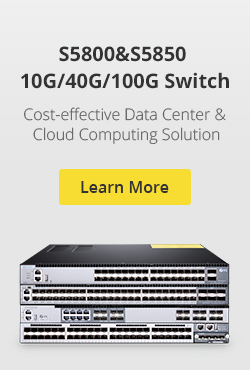 Because the SFP-10G-SR is 10 Gbps only. It runs at 10 Gbps link rate and no other speed. GBIC, SFP, X2, QSFP, CFP modules will only negotiate to one speed and one speed only. You cannot interconnect them. 5. Can we connect GLC-SX-MM to GLC-LH-SM? Some users wonder if they can use GLC-SX-MM together with GLC-LH-SM? In fact, the GLC-SX-MM is multi-mode LED-based. The GLC-LH-SM is singlemode laser-based. They may (sometimes) work with mode conditioning patch (MCP) cables but it’s not generally a good idea unless it’s completely unavoidable. 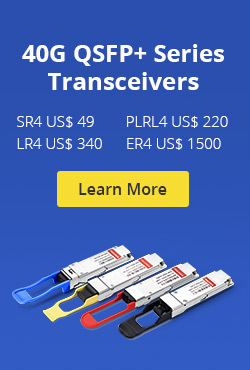 FS offers a variety of fiber optic transceivers (SFP+, XFP, X2 and XENPAK) at very economical prices which can satisfy your requirements from 1G to 100G Ethernet. In addition, all these optical transceivers are in stock and you can enjoy the same day shipping service. For more information, please contact us over sales@fs.com. This entry was posted in SFP Transceiver and tagged 1G 10G SFP, GLC-LH-SM, GLC-SX-MM, LC-SC patch cable, optical transceiver, SFP SFP+ PORT, SFP-10G-SR, X2-10GB-LR, X2-10GB-SR, XENPAK-10GB-SR on March 3, 2016 by Alice.Gui.